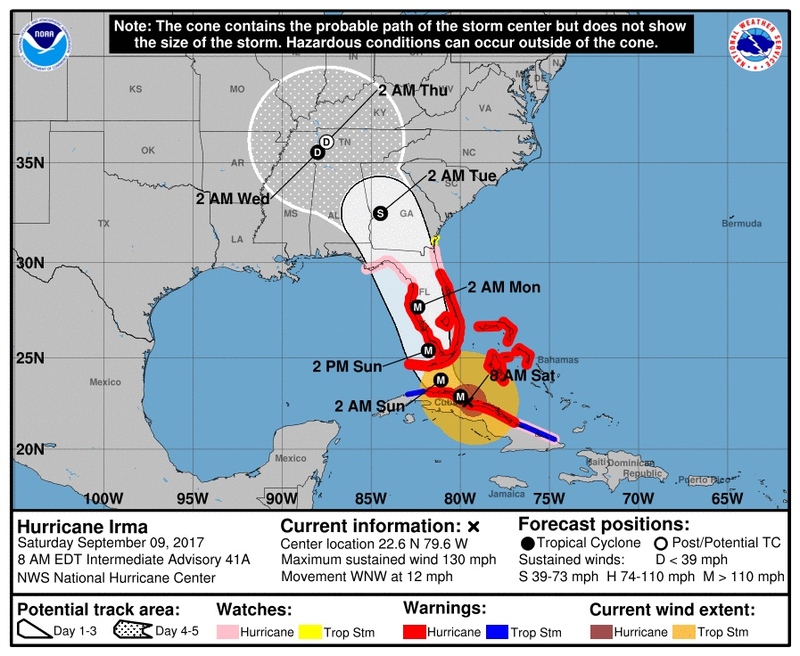 Hurricane Irma is barreling towards the Lower Florida Keys and southwest Florida as a large, powerful hurricane on the threshold of Category 4 or 5 intensity. Irma is forecast to remain at least a Category 4 hurricane through passage of the Lower and Middle Florida Keys and southwest Florida coast. Hurricane Irma's forecast track as of 8 a.m. on Saturday. Irma's hurricane force winds extend outward for 70 miles from the center, meaning communities that do not even take a "direct hit" from Irma will experience destructive winds. 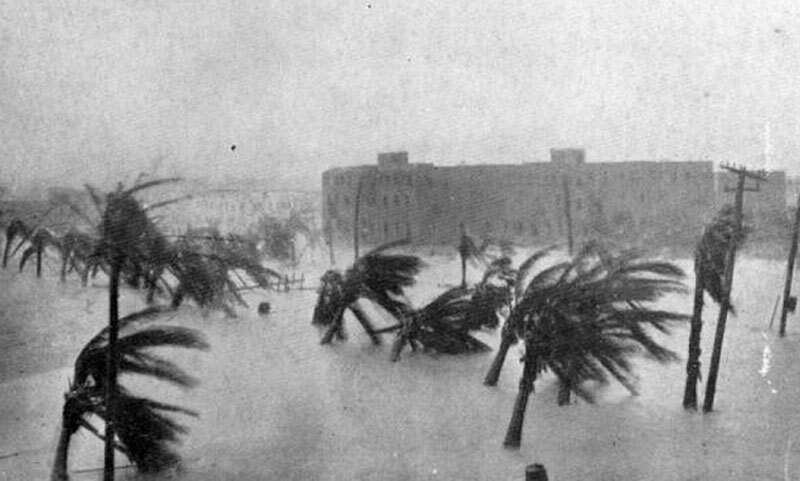 I am a hurricane and storm surge researcher, and my concern about people staying through a Category 4 hurricane comes from personal experience. I have lived through five “hurricanes,” but I have never actually experienced hurricane force winds. 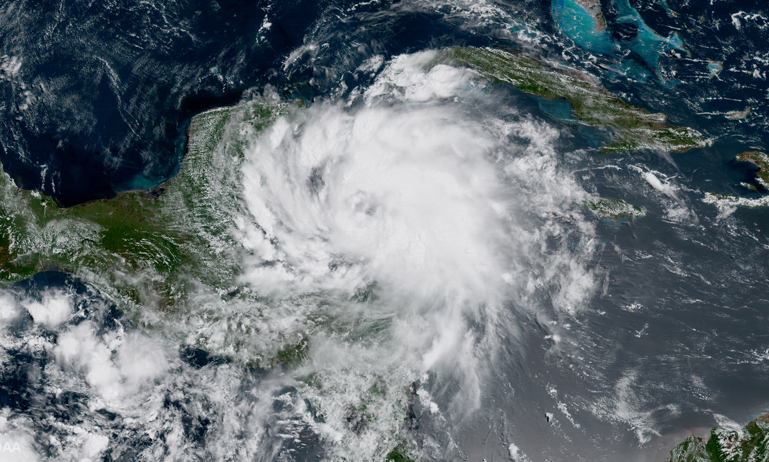 The five hurricanes I lived through are, Erin (1995), Gustav (2008), Ike (2008), Isaac (2012) and Harvey this year. I put hurricanes in quotes because I have never actually experienced hurricane force winds, which are defined as sustained winds of 74 mph or greater. I have, however, observed tropical storm force winds, sustained around 60-65 mph, as well as the damage caused by hurricane winds soon after landfall. The worst wind damage I've seen from a hurricane was from Hurricane Gustav. Although Gustav made landfall in south Louisiana as a Category 2 hurricane, maximum sustained winds near my home in Baton Rouge were around 60-65 mph with gusts approaching 90 mph. Those winds were strong enough to make Baton Rouge look like a war zone according to many eyewitnesses. Trees crushed houses all over my part of the city. Power was out at my house for 10 days. Damage was extensive. 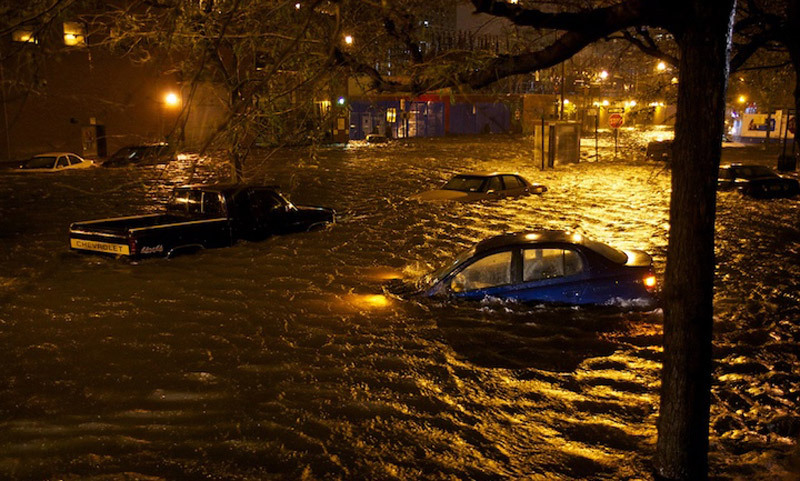 And all this from “just” tropical storm force winds, which we might think of as a Category 0 hurricane. 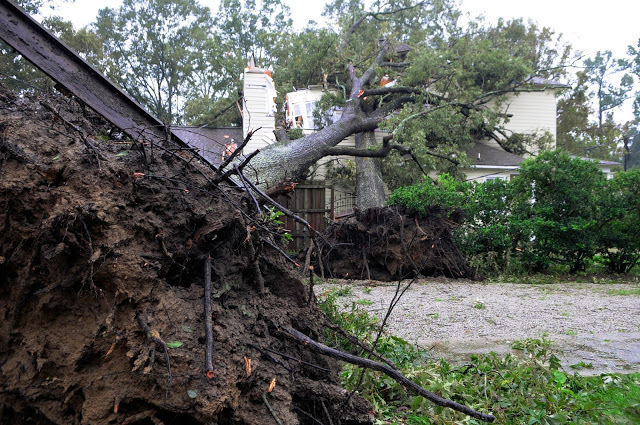 The pics below show Gustav damage in Baton Rouge. Hurricane Gustav (2008) damage in Baton Rouge, La. Two weeks after Gustav, I was doing fieldwork in Texas during Hurricane Ike. The closest I could get to landfall was the city of Orange, Texas. Although Ike's storm surge was surprisingly high, one of the lasting images I have from that storm is a billboard sheared off and lying in the road. 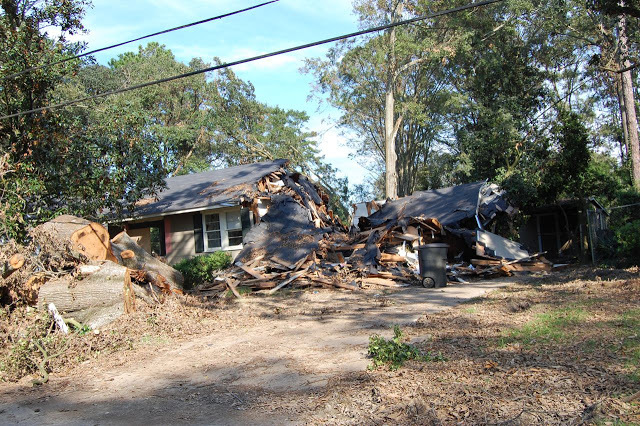 This damage was likely caused by tropical storm force winds, not exceeding 70 mph. I cannot imagine living through Irma's passage in places like Naples, Fort Myers, Venice and even Sarasota. It's not imaginable for me because the force of hurricane winds quadruples as wind speeds double. Basic math tells me that the 140 mph sustained winds forecast for southwest Florida are five times as destructive as the devastation I experienced from Hurricane Gustav back in 2008. Irma is will likely weaken slightly as it approaches the Tampa metro area, but may arrive as a Category 3 hurricane, which will inflict widespread destruction on the city. Although it is challenging to evacuate large metro areas, people living under trees should be particularly concerned in this region. It's not too late to evacuate if you live along the southwest Florida coast. Evacuation is a pain. I personally prefer to shelter-in-place with a stockpile of food and water. Last week when Hurricane Harvey hit Texas I stayed in my home in Galveston, a barrier island southeast of Houston. I am on elevated ground and I felt safe during Harvey because the main hazard in my region was torrential rain, and I live up high. I would not feel comfortable at all staying in any coastal towns south of Tampa on the Florida Gulf Coast. Even if I managed to survive the ordeal, my house would likely be unlivable and without utilities for weeks so why stay? If you are in this area, I would urge you to strongly consider evacuating inland to a shelter if you cannot stay with friends or in a hotel. 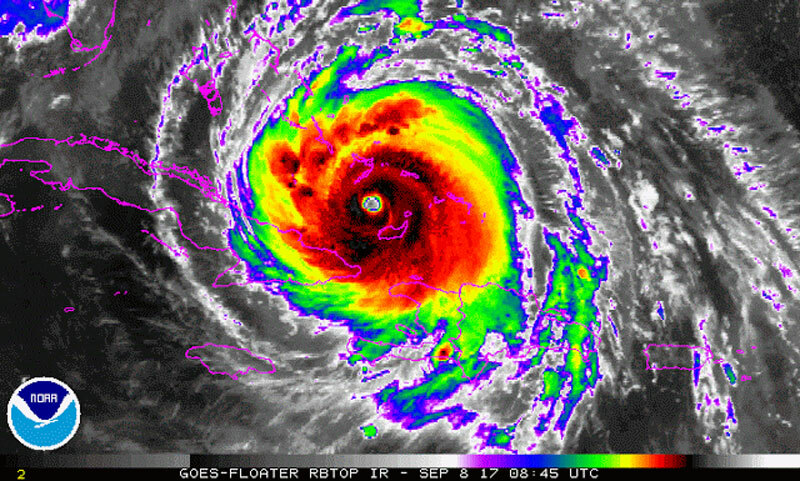 Irma will generate a catastrophic storm surge in Florida Keys with surge levels likely reaching 10-14 feet in Lower and Middle Keys and localized maximum levels of 14-16 feet where the eastern eyewall makes landfall. Of course, all this relies on the hurricane wind and track forecast remaining relatively accurate. Storm surge in southwest Florida could reach these same levels in areas passed by Irma's center to the west, which is most probable from Naples south. Areas where Irma passes to the east will observe a noticeable "negative" storm surge, where saltwater is pushed out of the bays and estuaries, followed by a sudden rush of a "positive" storm surge immediately after the eye passes. This is called "wrap around" storm surge (at least I call it that), and surge in those areas should reach around 6-10 feet. Storm surge near Tampa is highly dependent on the storm track. However, expect a negative surge followed by a positive surge and the possibility of a 4-8 foot storm surge from hurricane force winds blowing in from the southwest after the eye passes. Keep in mind that storm surge refers to the elevated height of sea level, but does not include the large, destructive waves that may ride on top of a storm surge. So if your first floor elevation is 12 feet and storm surge as high as 10 feet are forecast for your area, imagine a new sea level two feet below your house, with even 3-foot waves washing into your first floor. Scary stuff. If Irma's track stays just offshore, this will mean higher storm surge for communities along Florida's west coast. It could also lead to a "shelf wave" developing from Clearwater north, as a bulge of water essentially gets trapped between the storm and the coast. This happened in Hurricane Dennis (2005), and it exacerbated storm surge for areas like Cedar Key and St. Marks. I like to include pics and graphics in my blog posts. However, I'm sending this as mostly text to get this out ASAP.